CHICAGO/TOKYO (Reuters) - Biogen Inc and partner Eisai Co Ltd are ending two late-stage trials of their experimental Alzheimer's disease drug aducanumab, a major setback in the quest to find a treatment for the mind-wasting disease and a blow to Biogen, which lost more than $18 billion of its value on Thursday. Experts had seen aducanumab as one of the last tests of the hypothesis that removing sticky deposits of amyloid from the brain of patients in earlier stages of the lethal disease could stave off its ravages, which include loss of memory and the ability to care for oneself. Biogen shares fell nearly 30 percent to $225.70, its largest drop since February 2005, when they fell nearly 43 percent to close at $38.65 on Nasdaq. The decision was based on a so-called futility analysis of aducanumab data by an independent monitoring committee that determined the trials had little hope of succeeding. Markets in Japan were closed for a national holiday so the impact of the news on Eisai will be delayed. Eisai in July had touted promising but confusing 18-month results from another Alzheimer's drug, BAN2401, being co-developed with Biogen. That drug failed in a 12-month analysis. Investors had been cautiously optimistic about aducanumab following early promising data. 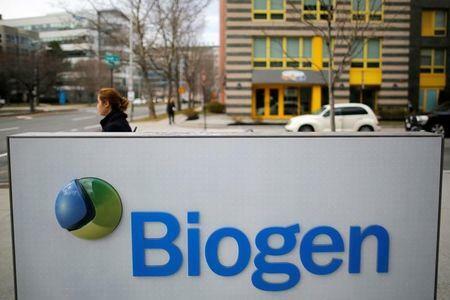 Without potential future revenue from Alzheimer's, Biogen has poor growth prospects as it faces patent issues over its big-selling multiple sclerosis drug Tecfidera and possible competition to spinal muscular atrophy drug Spinraza, Wall Street analysts said. "We view this as a transformative failure for Biogen's pipeline," RBC Capital Markets analyst Brian Abrahams wrote in a research note. Abrahams, who reduced his Biogen price target to $240 per share, said further declines were likely given that "investors owned Biogen to not miss out on what could have been one of the biggest blockbuster products in the pipeline of large biopharma." Any successful treatment for Alzheimer's, which affects about 5.7 million Americans, is virtually guaranteed to become one of the world's top-selling drugs. But efforts so far have had a dismal track record, with more than 100 failures. The two halted trials were in the final stages of testing aducanumab in patients with mild cognitive impairment due to Alzheimer's and mild Alzheimer's disease dementia. Detailed results will be presented at a future medical meeting. "This disappointing news confirms the complexity of treating Alzheimer's disease and the need to further advance knowledge in neuroscience," Biogen Chief Executive Officer Michel Vounatsos said. Eisai and Biogen said they would continue to work on other Alzheimer's treatments, including BAN2401. Guggenheim analyst Yatin Suneja said Biogen instead should be looking to build its pipeline through acquisitions. "They need to stop wasting or stop investing money in Alzheimer's now," Suneja said. Suneja said Biogen has about $42 billion in financing capacity and identified potential acquisition targets such as Sage Therapeutics Inc , GW Pharmaceuticals <GWPH.O> and Zogenix Inc that are "very interesting companies that should be considered now, more seriously." Major drugmakers, including Eli Lilly and Co, AstraZeneca Plc, Roche Holding AG, Pfizer Inc, Merck & Co and Johnson & Johnson, have abandoned Alzheimer's drugs targeting amyloid because of lack of efficacy or safety issues. Roche is still testing an amyloid-targeting drug, gantenerumab, at a higher dose after it failed in a trial in early-stage disease. Dr. Ronald Petersen of the Mayo Clinic, who has consulted for Eisai and Biogen, said amyloid is clearly linked with Alzheimer's because it shows up in the brains of people with the disease. But removing it did not appear to help. "Should we abandon amyloid? I'm not completely there yet, but you'd certainly like to see some kind of positive response." Many companies including Biogen, Eisai, Lilly and AbbVie, are pursuing alternative approaches, such as focusing on tau, another Alzheimer's protein that is more closely linked with the onset of symptoms. Others are pursuing targets aimed at reducing inflammation, which is believed to play a role in the very early formation of the disease. Dr. Howard Fillit of the Alzheimer's Drug Discovery Foundation said research must identify biomarkers and diagnostics to help "weed out ineffective drugs earlier," before they are tested in large, expensive trials. Fillit said aducanumab hit its target and removed amyloid but still did not help patients, which makes him "very pessimistic that the amyloid approach will work clinically." He said BAN2401 is not that different from aducanumab. "If they want one more shot on goal, I would think that would be a business decision rather than a strong scientific decision."